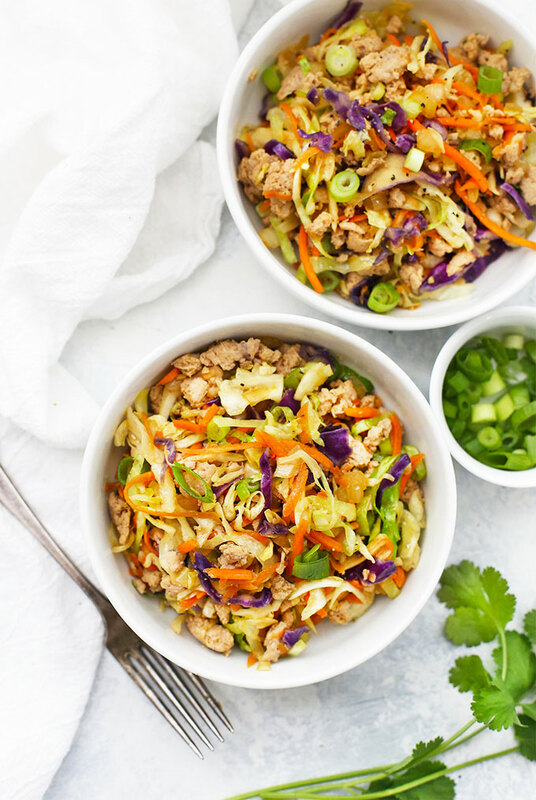 Egg Roll Bowls – This deconstructed egg roll makes a perfect quick-and-easy one pan dinner. 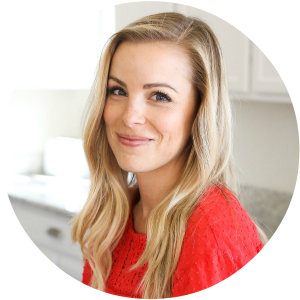 Gluten free, paleo & Whole30 friendly. Scroll down for the full recipe + video! 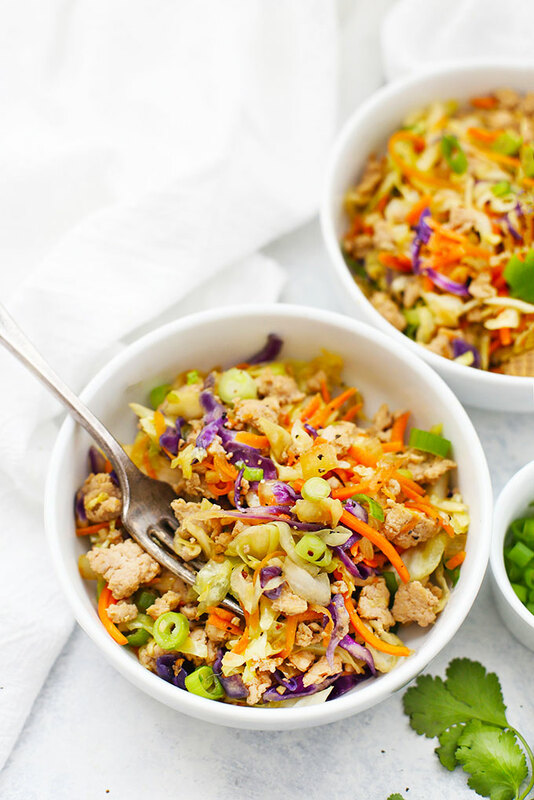 I’ve seen Egg Roll Bowls (or “Egg Roll in a Bowl”) all over the place lately and can’t get over what a great idea they are. (Whoever “invented” this idea first is a genius!). A quick stir-fry dinner that’s perfect for a busy night? Count me in. Aaaand if you’re wondering “what exactly is an egg roll bowl?,” it’s basically just an unpacked version of egg rolls. Think all the filling components without the wrappers/deep frying. What’s in an Egg Roll Bowl? 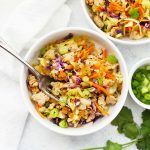 GROUND PROTEIN – I use ground chicken in our egg roll bowls because it goes over the best at our house, but see the FAQ below for other choices that also work! 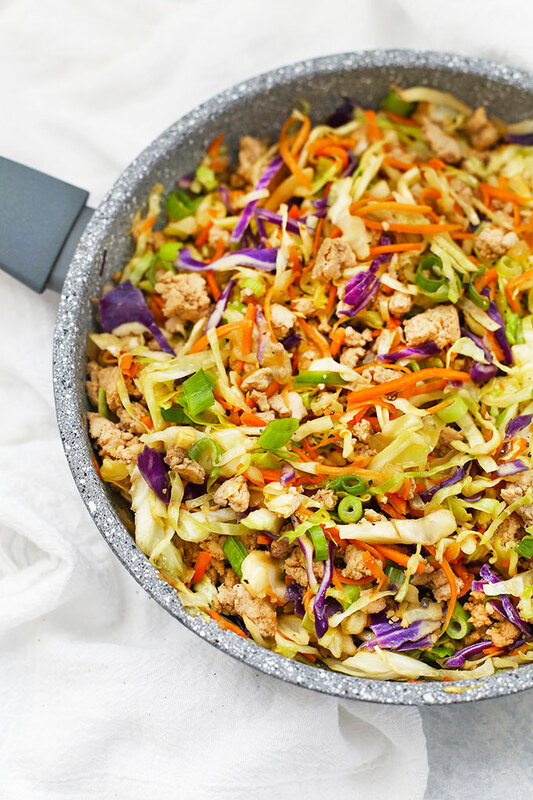 COLESLAW MIX – A key ingredient for egg roll bowls! I pick it up in the bagged produce section near the lettuce. Usually sold for under $2 a bag, this shortcut is also budget friendly. It’s simply a mix of shredded cabbage (green & red or just green) + a few grated carrots. GRATED CARROTS + ONION – Since I like a bit more color and substance, I punch things up with a few grated carrots. I love the color and flavor they bring to the table. The onion is a nice base layer of flavor that’s soft and not too strong in the final product. GARLIC + GINGER – These aromatics lend a distinctly Asian-inspired flavor to the dish. Love this combination. TAMARI OR COCONUT AMINOS – A bit of umami and saltiness to balance out the flavors. 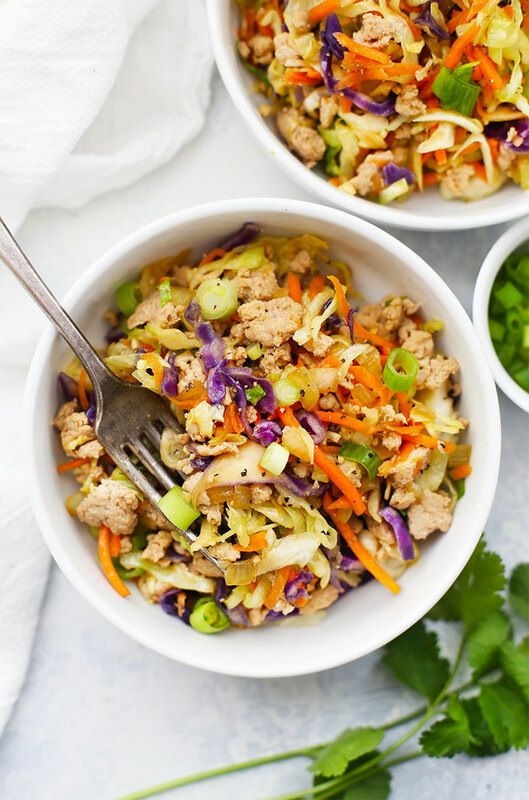 We most often use low-sodium gluten free tamari for egg roll bowls, but you can use coconut aminos for a paleo option (delicious!) or soy sauce if you don’t have any dietary restrictions. GREEN ONION – The final garnish. It’s fantastic here for color and taste. You can also go off the books and add a bit of minced cilantro if you like. How Do You Serve Egg Roll Bowls? IN BOWLS AS A MAIN DISH – You have lots of options! 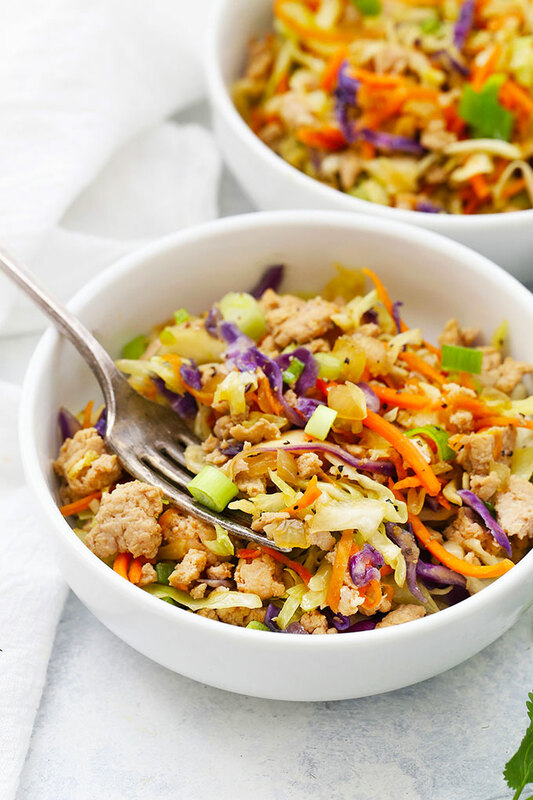 It’s easy to serve egg roll bowls as an all-in-one option and complete main dish. If you serve it as a main dish, you’ll get about 4 generous servings. AS A MEAL COMPONENT – Or, you can use it as a meal component, and serve it with steamed rice, scooped into lettuce cups, or with extra veggies. When we make this for a family dinner, it goes over best when served with rice. If you serve the egg roll bowl as a component or the meal (served with rice, in lettuce cups, etc. ), you can probably stretch it to 5 or even 6 servings. SIDE DISH IDEAS – Besides some steamed rice or extra veggies, we love sliced mango or fresh fruit as a side dish. Something light and bright makes a nice contrast to the umami-rich stir fry and veggies. 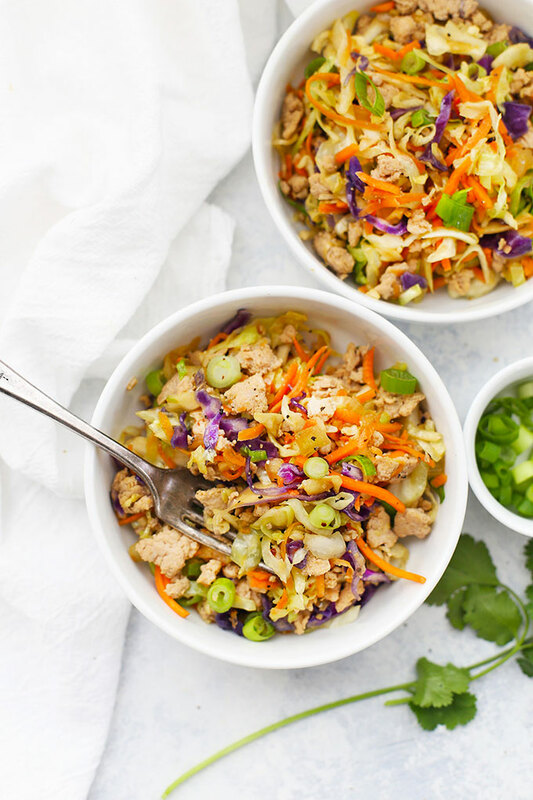 PALEO & WHOLE30 NOTES – Your egg roll bowls can easily be paleo & Whole30 compliant by using a few simple swaps. First, use coconut aminos in place of the gluten free tamari. Second, use apple cider vinegar in place of the rice vinegar. Easy-peasy! OTHER MIX-IN IDEAS: You can easily add more veggies to your egg roll bowls or spice things up. My favorite extra veggies to add are bean sprouts or thinly sliced/diced bell peppers. Another variation is to add a little spice with a pinch of 5-spice powder. Or, you can add a bit of kick with a few shots of sriracha at the end! CAN I USE GROUND TURKEY OR PORK INSTEAD? Yes! You can use any ground meat you like for your egg roll bowls. I don’t personally care for ground turkey, so I use ground chicken breast. Delish! Made this last week! Great recipe! YAY! So glad you liked it, Hannah! Delicious! Will make it again soon. Thanks! I’m so glad to hear that! Thank you for sharing!